Allure and seduction collide with this beautiful women’s shift style dress. 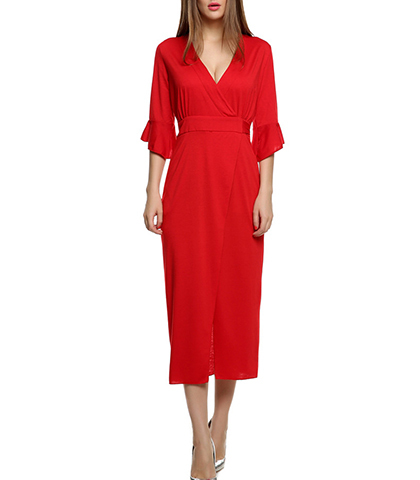 With its fire engine red color, this dress is definitely not designed for the shy woman! A knee length hemline and modest V neckline make it appropriate for all occasions, but the ruffled three quarters length sleeves and wraparound waist with a bow in the back ramp up the wow factor. This hidden, thigh high slit in the dress’s skirt lets you show a little leg when you want to ensure that all eyes are on you. This dress is available in sizes small, medium, and large.